While scanning discussions of Case Management, I am seeing two distinct approaches. Those familiar with this blog already know of Adaptive Case Management (ACM). However, there is a different approach which meets an entirely different need. I call that approach Production Case Management (PCM) and let me explain the difference. Production Case Management (PCM) is programmed by specially trained technical people (programmers) to produce a case management application. That application is deployed for use by knowledge workers to get their work done. The application offers collections of operations that the knowledge worker can decide to use or not use depending on the specifics of the case. A PCM application is used when there is a certain amount of unpredictability in the work, but still a large enough volume to make identifying and codifying regular patterns. A workers who use a PCM application is less in control of their work patterns which are defined centrally. Thus a worker using PCM will be involved in the outcome of a particular case, but not completely responsible for the ways that the case can evolve. The PCM application does not have a strong process orientation that a Human Process Management (HPM) system or Process Driven Server Integration (PDSI) system would have. (See Seven Categories to Replace BPM) A PCM application might have a set of high level states which the case can transition through, and each state can offer differing sets of options to the knowledge worker. So a case can be seen as being progressed through a set of states, but those states are more used as a description of the status, and less as a definition of what operations must be done. Because the PCM application is developed by programmers, it can makes use of more traditional mechanisms for data integration: structured information can be read from some sources, transformed, and written to other destinations. The sources and destinations can be web services or applications with an API. Like a typical development model, once the application is coded, the design rationale behind a particular transformation is not included in the final produced code, because it is not needed. PCM is used when the number of knowledge workers doing the same job is large, and the domain relatively well known, but the process is not entirely predictable. You might use PCM for telephone system or cable TV repairmen. These people need to visit the site, determine what the problem is, and then prescribe a resolution from a menu of well known operations. It is hard to represent what these people do as a traditional HPM process because it is not predictable enough for a defined process. The process unfolds at run time because the first resolution might not work, and that tells the repairman more about the situation, and possible leading to further action. Yet at the same time the repairman is not in a position to invent entirely new procedures. The phone/TV system is big and complex, and therefor the repairman’s options are necessarily restricted to those operations that are well known not to cause a problem with the operation of the system. There are a lot of service businesses which can make use of PCM. For example auto service: the car is brought in, there are a set of things to examine, there are decisions about what to repair or replace, and the are states of the process which, with any luck, end with the car being ready to be driven home. The situation where PCM is most useful when the number of nearly identical offices is large, and the knowledge worker is a professional but not necessarily an owner of the process, and the process itself is not predictable enough to specify in advance. The resulting case file represents a system of record for the work that was done. ACM is used for what I would call true knowledge workers: inventors, creative people, executives, managers, innovators, entrepreneurs, doctors, lawyers, etc. These are people who really do need to decide their course of action every day, and the course of action might be to things that have never been done before. A board of directors does not have a menu of options to pick from when it comes to actions to take. Someone responsible for the merger of two companies will not have a system with all possible actions pre-programmed. A doctor responsible for the survival of a patient may prescribe radical and untested treatment if it seems like the only option. PCM is for situations where the number of workers is high, and yet the course of action on a given case is not highly predictable. The number of knowledge workers needs to be high so that the cost of developing a dedicated application can be justified. Also, those knowledge workers are less responsible for the work. For example, while a Doctor might be in a position to prescribe a radical treatment, there are many other who work in a health care facility who should not have that flexibility. The routine care of a patient may still too unpredictable for a fixed process, may still require the judgement of a nurse or clinician, and still the options available may be restricted to a set of known actions. 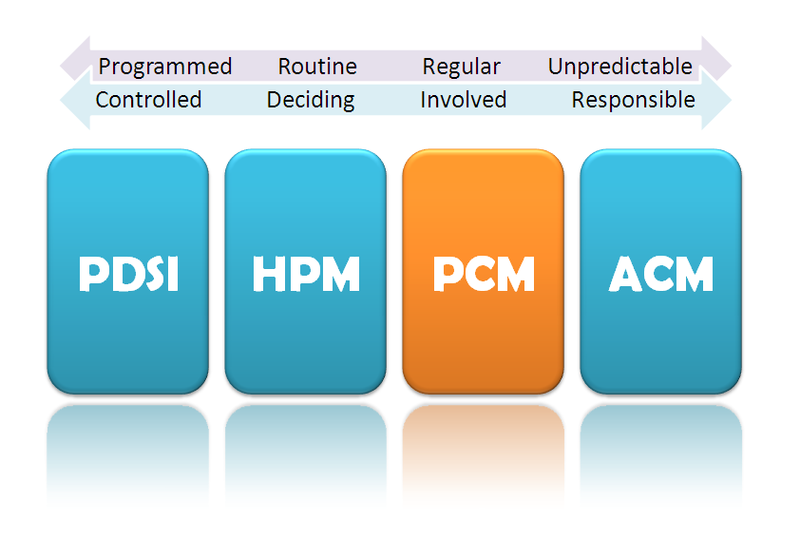 As you see, PCM sits squarely at a mid-point between HPM and ACM. It is developed and has a life cycle like HPM, it is deployed to potentially a large number of people in identical positions, and the cost of development is recouped from a small increment in efficiency across a large number of people. At the same time the work being done is unpredictable like ACM, and depends upon the judgement of the workers who leverage their expertise in that particular domain. knowledge worker for hire – someone is trained in a specific field, and learns to be an expert, but has little or no ownership of the overall process. A car mechanic must make accurate suggestions on how to repair the car, but does not take responsibility for the business, and must work within the constraints set by others. knowledge worker with responsibility – someone who can plan and be responsible for the course of events. This is the knowledge worker defined by Peter Drucker as “knowing more about their job than anyone else in the organization.” These are the workers who handle the wicked problems and have to think outside of the box. I am sure there are many more distinctions between types of workers, but for now this seems to be a determinant for whether you use PCM or ACM. For more on PCM, ACM, and case management in general, see the WfMC Case Management Excellence Awards. This entry was posted in Adaptive Case Management, BPM and tagged acm, Adaptive Case Management, Case Management. Bookmark the permalink. Keith, thanks for a great post to clarify the different use case for PCM and ACM. I often see people arguing the use of ACM and its similarity to HCM when they are actually referring to PCM. Both ACM and PCM fall in the Event-based rather than Flow-based category and adds great benefit to your knowledge worker examples. Thanks again for highlighting the differences. Thank Pieter for the comment. I found a number of case management products actually support PCM well, and not ACM. I think there is room for both approaches. I agree with you that the most important thing is to be clear about which we are talking about. Can you please list some of the case management products that support PCM to which you are referring? @David, I don’t have a list. Fujitsu’s Interstage Business Operations Platform (BOP) supports PCM. The OMG work on CMMN is focussed primarily on PCM since it involves modeling up front, and deployment of an application to users. Any product claiming CMMN compatibility is highly likely to be PCM. I wish I had a list of such products. In spite of not many people are “in” this topic and English is a relatively reach language, we are colliding on abbreviations already. I am pointing to your review of my article where I proposed “Purpose Case Management”, which also goes as PCM. BTW, that article was submitted in March 2011 with this term but found its way to public reading only in May 2012. So, I do agree with you about how “Product Case Management” may be positioned but I also see that it is not a ‘pure’ entity. To my understanding, it is a mixture of BPM and ACM with a balance shifted toward BPM. This mixture has asured that “Purpose Case Management” is an upper level or a container for ACM, BPM and “Product Case Management” though in your classification it was a “mixture”. may be a good thing as well as for chemistry, healthcare, medicine and similar areas where Best Practices must be enforced. At the end of the day, a well written business process may include a logical fork to predefined alternative “next steps” while the decision logic may sit with the process worker. I understand that your position on ACM is based on “non-predefined” actions. They may be unknown or unexpected to the designers of the process but I do have doubts that they are unpredictable indeed; simply saying, people did not trouble themselves trying to analyze and “predict” possible situations. I wrote about this in the article. (The less you know, the more unpredictable’s around – you can quote me on this). It is “Production” not “Product”. The production implies that it has been designed for volume use which is the key behind it. Stay tuned and I will explain more about it, because it is a distinct approach, that is neither BPM nor ACM.